There's very little to grumble about and for grab- and-go use this head is excellent. Great tone and player-friendly response. Overall performance is excellent. Since 2006, Ashdown - the UK brand of world-class bass amp fame - has marketed its guitar amplifier range under the name of Hayden, a unique and separate identity. It's a tough market, but Hayden has gradually been winning acclaim on both sides of the Atlantic. Here we're looking at an amp from the recently revamped MoFo range: the 15-watt Mini MoFo. In terms of its shouting voicings, the Mini MoFo's power section comprises two EL84 valves - made famous, of course, by classic British amps including the Vox AC30, but also put to great use these days in amps including the Fender Blues Junior, among many. In addition to an ECC83 driver, there's one other valve that's common to all of the new MoFo heads - an EM84 'magic eye'. Magic eye valves date back to the early days of radio when they were used as tuning aids, with a fluorescent 'cat's eye'- shaped display in the top of the valve that would move as stations were tuned in and out. 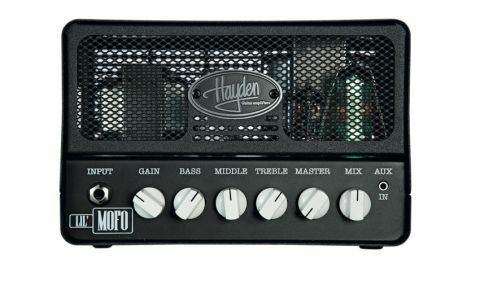 All of the new range of MoFo amps are single-channel designs when it comes to their front ends, with controls for gain, bass, mid and treble, plus an overall master volume. The Mini MoFo also offers a power reduction switch that reduces the output from 15 to just two watts. While this head doesn't offer much in the way of clean headroom, it's not lacking in punch, and at 15-watts, the Mini MoFo is certainly viable for smaller gigs with a suitable extension cab and a well-mannered drummer. With gain and master volume set at around halfway, the Mini maintains enough headroom and dynamic range to cut through an averagely loud band mix and cleans up nicely either from the guitar's volume control or simply by easing off with the pick. "It's our overall favourite of the new range, with superior note definition and tone that could give some boutique products a hard time"
Pricing is very competitive and we think this new Hayden has got what it takes to succeed in a market sector awash with steel-cased, medium- and low-power heads. It's our overall favourite of the new range, with superior note definition and tone that could give some boutique products a hard time.